Lazily peering over your publication of choice, admiring those whom you love, the scent of holiday baking and lunch left overs hovering in the air. Relishing these all too rare moments, living in them, appreciating them. Thankful that in this moment, there is no rush, no deadline and nothing on social media worthy of stealing this time of hushed leisure. Time is ticking, hurriedly rushing forward to the next hour. May we cherish restful times like these and the cherished ones we share them with. It’s too easy to squander our time with loved ones during the holidays as we get caught up in the hustle and bustle. We should strive to truly “be there” in every shared moment. You know how some moments just stay with you, all of your days? You couldn’t erase them from your memory, even if you tried? I remember one of those days. It started as a visit from a friend, who I’m sure was concerned about my well being after the recent loss of my mom. I don’t remember all of the details but I know God had His hand in it. On the outside, I was a wife and mother doing my best to serve my little family well. On the inside, I was a wreck. I hadn’t seen or even smelled anything that resembled peace in a very long time. As much as I loved my little family, I felt as if a part of me had died with my mom, who left us at the tender age of 49 due to infection after a liver transplant. She left me, her eldest, 8 months pregnant and struggling to make sense of a life without her. Honestly, the thought of continuing to live without her, didn’t seem possible. For the most part, I could hide my grief. My husband saw the really ugly days and held me as I was falling apart. He understood better than many, as he’d experienced great loss himself. Friends and family were supportive and said and did all the things they truly thought would help. But, like I said, on the inside the battle was raging and few knew how bad it could get on some days. Mom was my best friend, the person I spoke to every single day, the person I shared everything with. She had been an excellent mother from day one, but you don’t learn to have the deep appreciation until you are older and you don’t really understand some of what motherhood means until you have your own children. She advised on any and every problem without judgment, she was my biggest fan and Nana to my daughter. She had felt the movement of the grandchild she would never hold as she moved her hands across my swollen belly and spoke words of tenderness as she lay in the hospital bed. Once she was gone, I threw myself into the role of “the strong one”, but I didn’t realize that I could only do that for so long, that sooner or later I had to deal with it. I waited until after the baby was born, agonizing through labor without her by my side; I waited until I stopped nursing so the stress wouldn’t affect my little princess. Then, I shoved the pain inside and watched helplessly as it reared it’s ugly head touching my family through my lack of patience, my loss of desire for living and a dark depression which had settled over me. I don’t remember when I saw her again or if it was by telephone but not too much time passed before we spoke again. She uttered the words that spoke to me somewhere down deep and my soul raised a frail and weary hand to identify with them. She said, “I was telling mom what you said the other day about needing to talk to someone. Mom said that you already know Who you need to talk to.” Now, it goes without saying that my friend and I knew she meant I needed to take my troubles to the Lord. There was no explanation needed for 2 girls who had grown up on the little white church on the island. I don’t remember the rest of the conversation, but those words started a fire somewhere deep inside of me. They were simple words, brief and to the point, but I am so glad they were spoken and then shared with me. (Sometimes you will never know the effect your words can have on someone or how God will use you in mysterious ways to bring about change) Those few words weighed heavily on my heart and mind for days. I couldn’t shake them, couldn’t forget them and couldn’t ignore them. In retrospect, I realize that people were praying for me. At the time, even though they would say, “I’m so sorry, honey, I’m praying for you”, it didn’t resonate with me, didn’t even bring me comfort. It didn’t register in my spirit or maybe I was too angry at God for taking her to listen with my heart. I’m not 100% sure, but I know now that God had a plan and that in the depths of my grief and despair, at a time when I was far away from Him, He loved me. He saw me, He saw my pain and He reached out to me. A few days later, I found myself on my knees beside my bed pouring out my heart along with what seemed like buckets of tears. On that day, I finally surrendered. I gave everything to Him and I made a decision to turn away from all of the wrong, negative thoughts and turn to His Word and His council. I decided to to choose Him first and foremost. My heart was filled with a peace that I still do not understand. When I got up from that floor, my life was changed. To this day when people ask me to name something I gained from my relationship with Jesus, the first word that comes to mind is peace. I hadn’t had any peace for so long; it was such a welcome balm. There are so many who long for peace and look for it in all the wrong places. Do I still miss my Mother? Of course. But, I can honestly tell you that my grief doesn’t control me anymore. My earthly flesh will always miss her and feel a pang of hurt when holidays come or events occur that I would love to share with her. But, Mom is with Jesus and it brings me comfort to think that maybe she had something to do with my outcome, even if it was just her prayers. She always wanted her children to serve God and voiced that again near the end. There is a Way to peace and He waits with open arms. Run to those arms and find yours. John 14:27 “I am leaving you with a gift—peace of mind and heart. And the peace I give is a gift the world cannot give. So don’t be troubled or afraid. As I sit on my cousin’s porch here in Tennessee, the air is cool in the midst of my favorite season. The birds are filled with song and two little squirrels are chasing each other up, down and around a tree. In the midst of one of the most chaotic seasons of my life, I sing praises to my Creator and thank Him for His abundant mercy and the beauty of my surroundings. After losing our home in hurricane Irma, I am a grateful guest in a household that is filled with the love of Christ. Due to my granddaughter’s health condition and fearing long lines and possible fuel shortages, we fled the state of Florida prior to Irma’s approach. Some said we were over-reacting but I had prayed about it, discussed with my husband and had peace with our decision. He would stay and continue to make preparations and be close to assess the aftermath and my daughter, granddaughter and I would head for the hills. The first weekend I was here I remember sitting in Sunday school thinking that if I let one tiny teardrop fall, I was going to bawl a big ole ugly cry in front of a room full of people I didn’t know. I did cry during service as the Pastor described efforts already underway to send trucks of essentials and workers down to assist in our area. The emotions pre-Irma, mid-Irma and post-Irma have been like the tea-cup ride at Disney. One minute you’re screaming as someone spins the cup faster and faster and the next minute, you need to throw up. And, all of my emotions have been from afar, so add a strange sense of guilt for not being there with and for my friends and family. All I could do was pray, and that I did and continue to. Mid-Irma, we watched with horror as we experienced wind and storm surge in real-time, thanks to Facebook, face time and videos sent to us. We sometimes watched along with the people we love who stayed to ride it out, hearing the fear in their voices as the waters continued to rise. Thankfully, technology also provided a way to let us know everyone was safe immediately after the worst of it. Post-Irma my husband sent pictures of the destruction as he walked for the first time back into what we once called home. We cried along with him. We lamented some of our most painful material losses together, always thankful that we still had each other. Then we shed overwhelming tears of gratitude as we saw people from all over; loved ones, clients and strangers begin to load up trucks like the hands and feet of Jesus, destination Everglades City, to unload a little bit of love and hope. Homeless Irma victims, we have so much to be thankful for. We have family who immediately opened their home to us until we can find a place of our own, more family and friends, clients and colleagues who have blessed us with gift cards, money, prayers and encouragement, and a place for my husband to stay while he is down there working. We have our lives and our precious memories of how things used to be. We have a lot to do and some new paths to forge but I remain steadfast in the knowledge that my God will provide. He has not forsaken us, nor will He. This life is fragile and our things are perishable but His love is everlasting and His promises are sure. I pray for wisdom to follow without hesitation His perfect direction and plan for my life. My deepest gratitude to all who have helped in any way. May God richly bless you. Today is October 1, 2016 and I actually woke up a little excited about that. Anyone who has read my past blogs or who knows me very well will recall that we have entered my favorite month. The only thing casting a shadow on this otherwise lovely day is the horrible storm churning about in the Caribbean Sea, its sight seemingly set on Jamaica. I pray earnestly for those in the path of this hurricane. Somewhat selfishly, I am also vexed with the thought that the storm will interfere with my carefully laid plans to spend next weekend in North Carolina with my daughter and granddaughter. I have been looking forward to spending a few days alone with them, taking in some Blue Ridge sights as we enjoy some of the changes of the season together. I long to don a sweater, have my nose tickled by a blustery breeze and watch my granddaughter gracefully navigate a pumpkin patch somewhere along the way. I am dreaming of slurping warm seasonal soups and sharing a slice of apple pie with my daughter as we catch up. I envision us dancing along trails as we forage for adventure. I know the trees will have already begun their dress in more vibrant hues of gold and scarlet. They remind me of debutantes aspiring to be the belle of the ball as they slip into their fanciful attire. The ground may not be carpeted with the crunchy relics of summer yet, but in a few short weeks, the riot of color will cover the mountains. If I could stay for the entire month of October, I would. Better yet, I would stay until the last leaf floated down from the place of its origin and the skeletal trees shivered in the bitter winter wind, heralding winter. The prompt was “Crisis” and since NICU parents deal with this all the time, I thought this was appropriate. My daughter and I had a great day with our little Cali yesterday. I blogged before about Cali’s premature arrival and the complications she has faced since. She is 3 ½ months old and we still don’t have a homecoming date. We stayed in Miami last night so we were with her until around 9pm and my daughter even got to help give her baby a bath for the second time ever. It’s tricky with a PIC line. Also, when you live over 80 miles away and spend most of your days here, and the baths are given at night, it’s tougher to participate. Last night was the first time I had ever seen my beautiful little granddaughter’s skinny little behind. What a sight to behold! We got up this morning and had breakfast, anxious to arrive at the hospital. In good spirits, I parked the car and I chose the stairs as my daughter took the elevator. We usually park on the 5th floor but I always beat her by taking the stairs. And believe me; I need the exercise with the delectable guava pastries (stress eating) that Nicklaus Children’s Hospital serves. Leave it to me to know about the food. There was a long line at the check in and since I had left my monthly pass in the car (and I wasn’t going back outside and up those stairs or in the sweltering parking lot elevator) I had to wait in it. Impatiently, Morgan flashed her pass and went on up to the 2nd floor, eager to see Cali. When I arrived in the NICU (Neonatal Intensive Care Unit) a few minutes later, I could tell by Morgan’s face that something was wrong. The nurse explained that Cali had begun vomiting last night and her heart rate had dropped a little a few times. This can mean so many things, but they were immediately stopping all food and doing blood work to rule out infection. They asked us to leave so they could insert a second tube in her nose (opposite nostril from feeding tube) to pull excess air from her stomach. My eyes welled up and in all seriousness, I wanted to curl up on the floor and cry. However motherhood kicked in and I knew I had to be strong for my baby girl. We went to the waiting room until the procedures were over and then my baby girl wanted to hold her baby girl. I sat in a chair beside her, more for moral support than anything. Cali slept and I looked around the room, which currently is home to approximately 7 babies; I overheard them say they have a total of 42 patients in NICU right now, which I understand is a lot for them. There are babies in much more serious condition than Cali’s. There are older ones, younger ones, bigger and smaller. Some cry a lot and some you never hear a peep out of (at least when I’m there). I pray for all of them and I ache for the parents and what they are going through. They come here from all over, show their ID or passes, push buttons so doors will open and wash their hands thoroughly multiple times per day. They sit in a room that is filled with beeping machines that have the power to give them quite a scare and they listen and try to understand as doctors and nurses reveal plans and strategies. Some of their children are growing out of the clothes and diapers they got at baby showers and some have even outgrown some of the toys. Yet, they face each crisis with a strength that I had never seen before, having had two healthy, and delivered at-term babies. I look at them and not only compassion floods my soul, but also respect and admiration. I will shed tears in my prayers over this little world I didn’t realize existed until April 13th. Sure, I knew there were sick babies, but I had no idea of the big picture. I have focused on one small group of breaking hearts in my post, yet there are hundreds of others. More people going through this life with a heavy load and dealing with things we can’t imagine unless we have been there. I know I’ve said this over and over, but let’s give people the benefit of the doubt because we truly don’t know. That lady in line in front of you with the blank look on her face who doesn’t hear the cashier saying, “Next, please”, could have been my daughter this morning. Be patient with her. We are praying and believe that Cali will bounce back from this step backwards and come home quickly and give her doctor’s a shock. This journey is increasing our faith and our strength and I thank God for that. God will continue to provide the strength, mercy and grace for each and every day. He always does! I would also be remiss if I didn’t thank the amazing team of doctors, nurses and all other staff at Nicklaus. We couldn’t be in better, more caring hands and I’m truly grateful. Oh, and a special kudos also to the cafeteria staff for their tasty creations and their smiles of concern. We also have the best friends and family ever and our community has rallied around us like a great wall of love and protection. There is NO way to begin to thank them all appropriately! Life is a saga, a long and complicated story with many details. It doesn’t matter who you are, if you live very long at all this applies. Our life begins on page one, with our birth and if you have ever been in a room of women discussing childbirth, that can be a saga in itself. We live, we learn, we grow and we change. We all have a story but it’s what we do with our stories that can make a difference. I was discussing this a little bit in my Sunday school class this morning. We go through things sometimes that make no sense, seasons filled with trials and tribulations. They are going to touch each one of us, but oh the difference when we allow God to teach us through them instead of sinking and wallowing in a big warm pile of self-pity. I’m not saying not to grieve or that it’s wrong to cry, but when we’re done, get up and move on and let what we have learned, even when it was a tough, teach someone else. Some of the things I have been through in my life have allowed me to counsel or encourage other mothers or wives who are now going through the same thing. Can God really take that year of weeping and hurting and use it to impart healing in someone else? Why, yes He can and I can attest to having been on the giving and receiving end of both trial and help. At times we try to pretend like we don’t know the meaning of grief or affliction and I’m not sure why, as we all are familiar with its sting. As I’ve mentioned in other posts, as long as we are this side of heaven, we will encounter difficulty. It’s how we deal with it that sets us apart. Wouldn’t it be great to know that your saga didn’t end at your death because even after your demise other lives were still touched because of you? I think we all want to leave this world knowing we have imparted wisdom, hope and truth into others. I was cleaning out a closet the other day and found an old journal of my mother’s. I’m sure I saw it and positive that I would have looked inside near the time of her death. The other day coming across the old treasure again I opened it up and saw that old familiar handwriting on the yellowing front page. For some reason I leafed through the other pages and buried in the middle were about five more pages that I had never seen before. They were written in and around December of 95’ and into the first months of January 96’. Mom died in June of 96’ so these “new” words were like gold to me. They were a new discovery of some of her personal thoughts in her final months. More of the saga of her much shortened life and they meant so much to me. They touched me and as I read them, I again felt her faith and strength. She imparted another precious gift to me almost twenty years after she met Jesus. I was blessed to have a mother whose wisdom and guidance has served me well over the course of my life. Whether we are mothers, fathers, brothers, sisters or friends, we too can choose to let our stories help us grow into better people and use their lessons to love on others. Isn’t that part of what love is all about? Since I like to impart knowledge to the younger crowd, I listen to their conversations with great attentiveness to things that bother them. When I hear them discussing relationships, my ears perk up because I have been married for 22 years and let’s just say I’ve learned a lot. So, in an attempt to save someone a little heartache or just to make you think, I wanted to share some thoughts. If you are currently in a relationship, it would behoove you to take great care to notice the things that irritate you now. Once you have been married for a few years, they will irritate you more. That cute little snuffling snore will become something you despise. Trust me on this one. I write more about it at Sleeping with the Enemy . A good marriage is work; it doesn’t just happen and it’s not 50/50 like so many say; it requires each giving 100% for the best shot at making it work. Because it isn’t easy, you should be careful when you begin to consider a spouse; someone you intend to spend your life with (because in my opinion that should be the goal at the onset). If you are looking at it as something you can jump out of at a whim, you’re going in with the wrong attitude. Unfortunately, that seems to be how many younger folks see it, but I digress. One of the things to consider is the fact that you cannot change someone. They are who and what they are and no amount of whining, griping, threatening, withholding or pouting is going to change that. That will only serve to make both of you more miserable. So, if you already have a growing list of the many things you do not like about your “love”, you better think long and hard about this. When you’ve been married a couple of years and the baby has been up all night, the ac is out and your checkbook is in the negative, it takes patience and stick-to-itiveness. At times like these, when your knight in shining armor has let his facial hair get all prickly and he is sitting in his favorite spot in his boxers all puffed up like toad, you have to dig deep, sister. It’s not always like the movies…wait, it’s rarely ever like the movies. What I am trying to convey is, don’t settle now thinking that your Mr. (or Mrs.) with the problem(s) is going to change once you marry, or once you have a baby, or once they get a job they like. If they have an addiction problem, they are going to carry it into the marriage and, in my opinion, keep it until they allow God to deliver them. If your “girl” has a spending problem, and you are very frugal, think twice or you might be paying off credit card debt for decades. If they aren’t romantic and you are sappy and schmaltzy and not happy if you aren’t having dinner by candlelight, think it through. I hear way too many of you young ones say, “Things will change when X happens”. No, they won’t. Don’t fool yourself. No marriage is perfect, but figure out what your deal breakers are. I am saying this as a woman with a failed first marriage that lasted 10 years and a 2nd one that has lasted 22. I love my husband dearly and I am grateful that we can talk things through and we have overcome many obstacles and have been through many storms together. We had family values in common and that is important. We don’t believe in going to bed mad so we don’t let things fester and get bitter over them. We are experts in the art of compromise. I would be remiss if I didn’t give glory to God for giving me the faith, grace and love to be a godly wife as I’m sure things wouldn’t have gone as well without His divine hand. Remember what real love is and ask yourself if this is the kind of love you have. Obviously we all fail at some of this at times, but following is a good set of scriptures to meditate on and have been a source of strength for me in the darker hours. In the words of St Paul – Love is patient and kind. Love is not jealous or boastful or proud or rude. It does not demand its own way. It is not irritable, and it keeps no record of being wronged. It does not rejoice about injustice but rejoices whenever the truth wins out. Love never gives up, never loses faith, is always hopeful, and endures through every circumstance. The day after Thanksgiving was reserved for putting away fall decorations and putting up all of my Christmas decorations and the tree. I had promised my granddaughter that she could help me and she was excited. My girls were laughing at me because I am so meticulous about everything is done and taking videos of me singing Christmas carols. They were cracking jokes about how mom has to the ornaments just right on the tree. I blogged about my tree perfectionism in Gone are the Matching Bows, where I told the story of how my mother in law encouraged me to let the tree be a kids tree instead of my own beautiful, flawless creation. Since my girls are grown, I have reverted back to decorating “my way”, so I assumed having a five year old help might be a little crazy. However, Ayda is a lot like her Nana and she handled everything so carefully. She packed away the fall decorations one by one, wrapping them carefully in tissue paper. Nana was very impressed! This all caused me to reflect upon one of my failures as a mother. Yes, I had failures; lots of them, although it wasn’t for lack of trying to be the best one ever. I was always such a stickler for perfection in all of the household tasks, that I never could accept how other people did the job. It’s not that I think I am perfect, or even that I did things perfectly; it was that it had to be MY way. There was only one way in my mind to load that dishwasher, fold the clothes, clean the bedroom, or organize underneath the bathroom cabinet. So, instead of saying, “I don’t like the way you do things”, I would just do them myself. I remember when the girls were young and they would clean their rooms. I remember being careful to tell them thank you and praise them for a job well done. However, I didn’t realize that they took notice when I went behind them rearranging and re-doing. I couldn’t help it, but they probably felt like it wasn’t good enough. When they got older and I would try to have them do their own laundry, it went much the same way. If they didn’t switch from washer to dryer right away, I just did it, because I didn’t have the patience to wait. When they folded and put away, I would cringe to open a drawer and see all the mismatched socks and wrinkled shirts. I spent way too much time arranging their drawers and sincerely thinking I was doing them a great service. I have now realized that they really didn’t care; for them, it was fine just the way it was. I know this because I have been to their homes and they didn’t learn from our drawer cleaning events; they look the same way they did in high school. When I try to figure out why I was the way I was, I remember my mother behaving very similarly. She was a stay at home mom most of our lives and she took great pride in her home. She was kind about it and I always felt nothing but love, but I got the sense that she would just rather do some things herself. You don’t get much help from the kids or the husband if you don’t take what you can get and be thankful for it. And it isn’t helping you anyway, if you are constantly re-doing it. I also ended up with spoiled children and a spoiled rotten husband. I’m not complaining because I’m to blame, but I feel like it was a dis-service to my girls. They both know how to cook and clean, but they hate the cleaning part and I wonder if that is because I made it such a big issue and did so much myself instead of making them help. I guess what I am trying to say is let them help, or MAKE them help and be happy with what you get. If you have daughters, their future husband will thank you and if you have sons, don’t you want their future wife to appreciate the fact that he does dishes? My husband doesn’t do any household duties; never has and probably never will. I almost passed out the other night when he offered to dry and put away the dishes. The dishes were almost done but he did try. After he dried a couple of things, he got distracted by something on t.v. so I grabbed the towel and finished myself….see there I go again. Humans have very strong scent memory. Tell us about a smell that transports you. 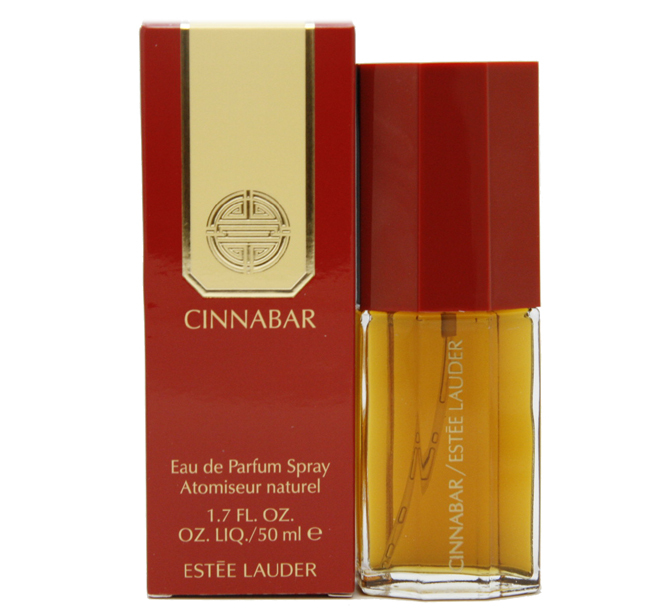 In the late 70s, Cinnabar was a very popular scent and one of my mom’s favorites. It was strong, spicy scent, with a woodsy, cinnamon smell. It lingered. Thankfully, my nose was more tolerant back then and I enjoyed the smell. Allergies began to assault me in my late 20s and now my finicky nose can only tolerate the lightest scents. My mom, my sister and I, and my aunt and two of my cousins all wore Cinnabar at some point during the late 70s and early 80s and I will never smell it without being whisked away to my teenage years. We would spray it on before any of our frequent outings to the movies, roller skating or dinner. I would imagine that when we were all together, as we often were, that we unknowingly wreaked havoc on many poor unsuspecting noses. I don’t smell it often, but when I do it brings a smile to my face and the realization of how blessed I was to have all of them in my life. I knew it then, but not in the way I know it now. Sometimes I think I will order a bottle so I can sniff it at will, but then that would take away the fun of my chance meetings with the lovely Cinnabar.